I was using a new method – yeah, my first attempt with xgboost. The data set was rather small and simple. What I found out was that there was too much parallelization happening. Somehow, all these threads and process were getting messed up, and, although there was progress, it was glacially slow. Looking at the stack – the parallization is not that obvious. Certainly I was using multiple processes via the parallel package, but what else – I was seeing a lot more threads running. The culprit in this case was the default parallelization in xgboost. Nowadays apparently every layer is trying to exploit multiple cores, thus, that wasn’t surprising, just something new to me. The fix ended up being quite simple – call caret’s train with nthread=1, which in turn is passed to xgb.train and solves the problem. Now everything is up and running, and I am looking forward to the output. I am curious are you distributing the processes in multiple machines or only one machine? If in one machine, all threads from multiple processes (from ‘parallel’) will cause lots of overhead. But it may be not such bad if distributed processes to remote machine. I’d like to see the code and performance data if it’s possible. Single machine in this case, and I didn’t realize that xgboost is multi-threaded by default. The presumption that a package can exploit all available cores on the system just because it was run on that system is questionable at best. I’m having trouble with xgboost threads. I have found that manually setting the number of threads is better than letting xgboost set it and can result in a massive speedup. I suspect that the problem is due to MRO, not xgboost. I’m still investigating so this reply is just preliminary. Ask me for some plots if you like. I’m doing all my testing while the machine is idle. 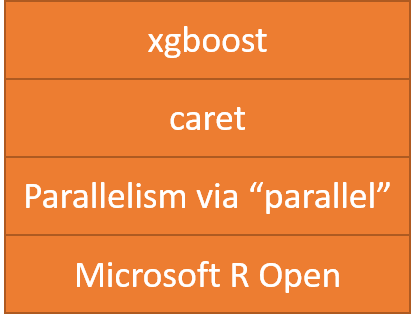 I suspect that xgboost in some situations is trying to use more than the available cores. I’m not blaming xgboost either. It may be a problem with the local OpenMP setup. I can verify what you have said – if you try to use more than the available cores you do get a spectacular speed reduction. Tony, are you on Linux? If so, htop helps see all threads as well. nThread = 1 was a HUGE help to me — thank you so much for this post!! I was experiencing the same throttling using caret and xgbTree, seems like both of their parallel backends were clashing because it was taking hundreds of times longer (with all threads at 100%) before the nthread fix in the caret::train function. XGBoost is really agressive in the way it utilizes all cores. I use it for online application over a Python Tornado web-server, and it’s performance is horrible when not limited, due to some thread mesh-up and oversubscription. I use the OMP flag OMP_NUM_THREADS=1 to limit XGBoost to 1 thread.